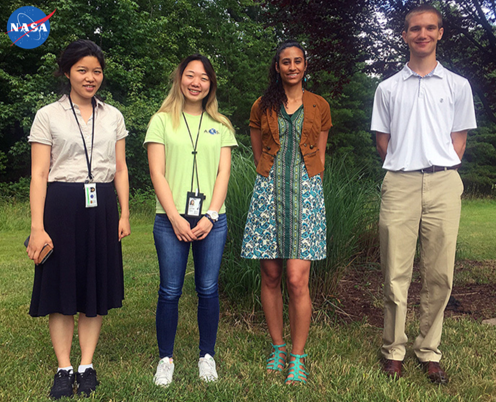 CW3E graduate student Tashiana Osborne was selected for a competitive NASA Internship this summer at the Goddard Space Flight Center in Greenbelt, Maryland. 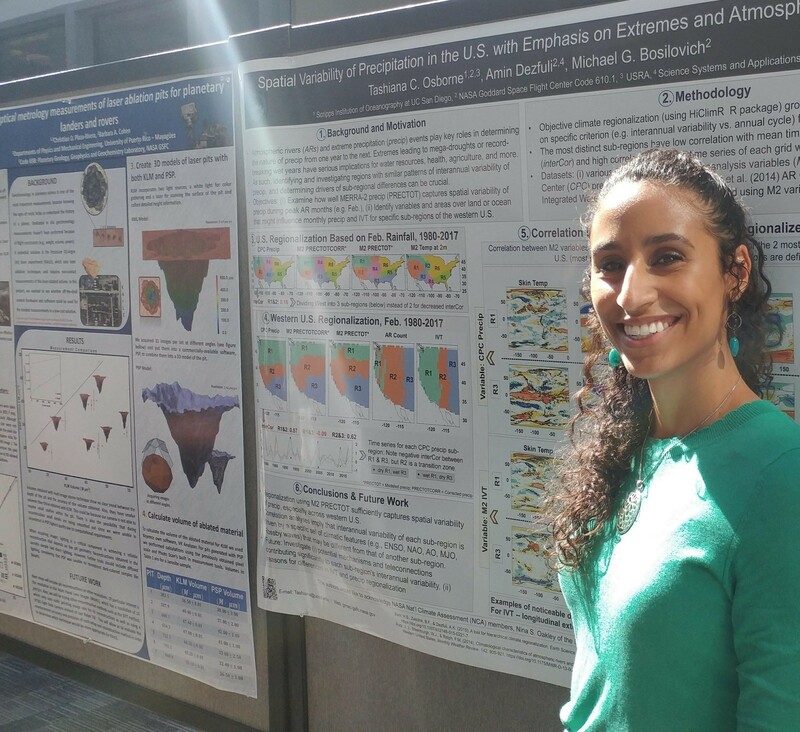 During her internship, she used MERRA-2 reanalysis products to examine the spatial variability and the year-to-year variability of rain and snow over the western U.S., with an emphasis on extreme precipitation events and the contribution of West Coast atmospheric rivers. 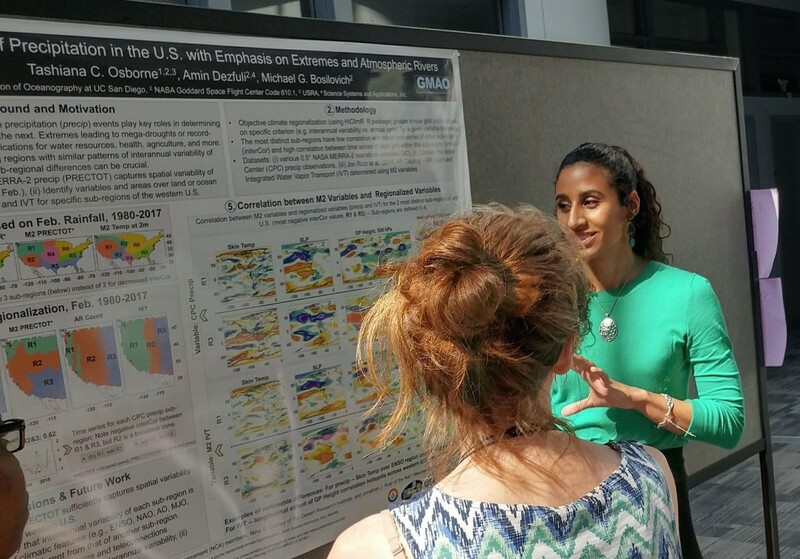 In early August, she presented a scientific poster to the Goddard community showcasing results. She will continue this work as part of her Ph.D. dissertation. 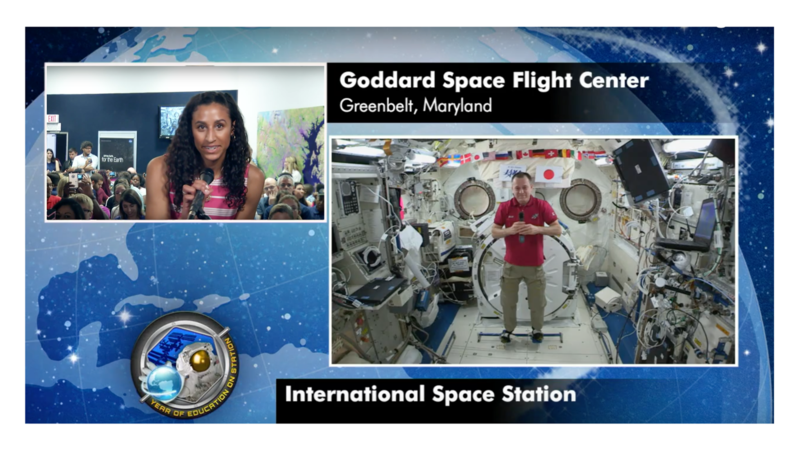 While interning at Goddard, Tashiana had a unique opportunity to speak with an astronaut currently aboard the International Space Station (ISS). NASA Astronaut Ricky Arnold formerly worked in the marine sciences and also as a science teacher in various countries. He became an astronaut in 2004 with his first space mission in March 2009, lasting almost 13 days. In March 2018, Arnold launched to the ISS as part of Expedition 55. This time, he won’t be back on Earth until October. Arnold, while showcasing the fun of microgravity, answered questions from visitors, employees, and interns at Goddard Space Flight Center during the July ISS Downlink event. He also shared his goal to “…shine a light on one of the most important jobs there is; being a classroom teacher” through his A Year Of Education on Station efforts (providing K-16 students and educators with NASA STEM activities). Hi Ricky. Thanks for answering our questions. What can we learn from space missions and exploring other planets that might help us in adapting to a changing climate here on Earth? Tashiana – Fantastic question, particularly [while] at Goddard Space Flight Center which invests so much energy in studying our home planet. Studying other planets helps us understand the mechanics of things that happen here on Earth. Right beside us in our solar system we have a planet, Venus, which suffered from runaway greenhouse gas and climate change. And Mars, which probably had a thick atmosphere at one point, and now really has a very thin one. [On] Mars, much like on Earth, when you want to understand what happened in past climates, we go to the poles and we drill into the ice and look at what the atmosphere was like. I think getting an understanding of the mechanisms and what happened over time to the atmosphere and other parts of the planet will give us a better understanding of how climate change is [affecting] and will continue to affect Earth. What do you see in outer space? How does it feel when you launch? What are some long-term health issues from being in space? How do you shower in space? How has your perspective of Earth changed after viewing it from space? Watch the astronaut Q&A video here. Previous post: CW3E Welcomes Dr. Luca Delle Monache	 Next post: CW3E Publication Notice: ARTMIP-Early Start Comparison of Atmospheric River Detection Tools: How Many Atmospheric Rivers Hit Northern California’s Russian River Watershed?